Next in my little series about THIS section of abandoned rail line in Skokie, IL is the Savannah Sparrow. Just last month I was seeing several of these darting in and out of the bushes that line the little open patch of scrubby habitat. Passerculus sandwichensis are generally insectivores, but in winter time switch their diets to seed. Although they are widespread throughout North America in open habitats, they are easy to overlook due to their secretive nature. You are probably more likely to hear their melodic, buzzing call, rather than actually see one as they favor hiding out in the brush. 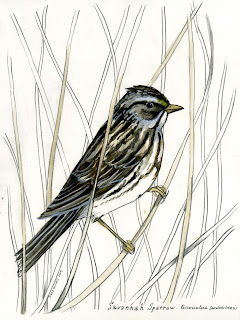 It's a modest looking bird, with dark, heavy streaking throughout its plumage, and a little yellow near the base of its upper bill.